This tractor from New Holland already has an excellent reputation for municipal jobs. 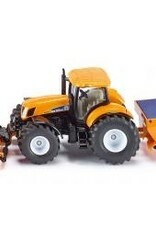 SIKU has equipped the 1:50 tractor as a winter service truck to deal with all the seasonal jobs. In eye-catching municipal orange and with New Holland branding, this municipal tractor offers many welcome play features. Of course, the ploughing plate can be moved in all directions, the salt spreader at the rear can be opened to fill with salt. Both winter service trailer devices are designed to be removable. This also applies to the cab with many original details. 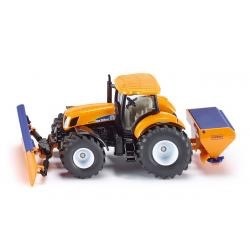 The municipal tractor is compatible for use with all 1:50 toy models from the SIKU Farmer and SIKU Super series.